Back in the early days of my stay in Ireland - way back in 1982 - staying in touch with my parents, sister and many friends back in the States was difficult and expensive. And for a number of reasons: the phone system in Ireland didn't work, long distance calls to the US were almost a buck a minute, and when we finally managed to get through, the connection might be interrupted at any minute by Mrs McGillikuty down the road who had inadvertently cut in on our conversation. Fortunately, things have changed and for the better. Now, keeping in touch with kith and kin is flexible, inexpensive, and easy. First, let me make the point of saying that I am not involved with any of the companies that I'm about to recommend. I'm not a shareholder or an owner. I'm just a poor slob who's tried a number of different telecommunications systems, and based on my experience - such as it is - believe that these might offer a way of saving a few bucks. 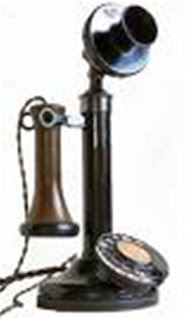 Getting a Phone - if you're staying over here for a prolonged period, you might want to invest in a standard land line. Back in the 'old' days, getting a phone here was a journey into the unknown: phones could take up to a year to be installed, and that small piece of plastic and metal that would be connected to the outside world could cost up to one thousand bucks. Nonsense! But fortunately things have changed. Eircom - this is Ireland's largest telecom company. The company offers a wide range of services including standard landline, broadband, wireless, and similar. The company has recently reduced costs significantly. Check them out. Perlico - my 'preferred' supplier. I pay about 60 euro a month for a bundle that includes landline, broadband, and wireless. That monthly fee includes 'free' calls to both landline and cell phones (called Mobile Phones over here), but there's a limit to the number of monthly free calls. If you exceed that number, you're charged extra for it. Check out their website for more information. Bundled Landline, Broadband, and Television - a number of companies now offer inexpensive bundles that contain these capabilities. Try BT or Google 'Television and Telephone Bundles in Ireland' for more information. Long Distance - want to make numerous long distance calls for next to nothing but don't want to install VOIP on your laptop or PC? Then check out Blueface. Calls to the United States cost less than a euro cent a minute. 1. Perlico - I use Perlico for my landline, broadband and wireless needs. That costs about 60 euro a month. 2. Blueface - I use Blueface to ring my Dad and anyone else I can think of who live overseas. 3. SKY - go to the link, but this company offers a wide range of products from about 30 euro a month. Mobile Phones - in Ireland, mobile phones and bundles are offered by a number of companies including O2, Meteor, Vodafone, and 3. Personally, I use O2. But all of these companies are constantly changing rates in order to attract customers. Visit their websites for more information. So happy talking! Today, doing so costs much less, for much less hassle, than ever.